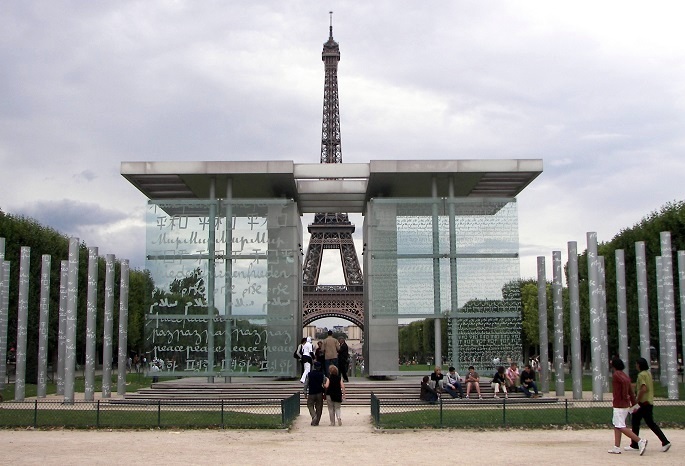 The Wall for Peace on the Champs de Mars in Paris. Fassent l'objet de tous nos vœux! Written in 1792 against the backdrop of the French Revolutionary Wars by Claude Joseph Rouget de Lisle, the French anthem was first known as Chant de guerre pour l'Armée du Rhin — (Song of War for the Army on the Rhine). It took the name La Marseillaise when volunteers from Marseilles marched into Paris singing the tune returning from the Franco-Austrian War. Adopted as the anthem of France in 1795, La Marseillaise is a patriotic call for the French to stand united against foreign tyranny. It's refrain: "Aux armes, citoyens/ Formez vos bataillons/ Marchons, marchons!/ Qu'un sang impur/ Abreuve nos sillons!" follows every verse when sung. Do you hear the roar of these ferocious soldiers? Would cut down our warrior sons! The masters of our destiny! Will receive their just reward! Ripped out their mothers' wombs!